Here, I’ll be explaining the how to properly use your whole body and pronate with the correct grip on the flat serve. On practically every serve, you should be using a continental grip. (See Picture Below). That way you are able to pronate more naturally, which will be covered in the next few parts. Part II – Learning the Use of Upper Body! Now once you are in this position, turn your upper body to the net. 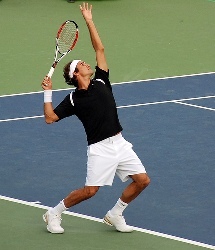 In this position, if you have a loose grip and relaxed arms, the racket should have naturally dropped down (on edge to the imaginary ball you’re hitting) and your left arm should have dropped down to your stomach as well. if you managed to do this about twenty times (or until it is second nature), you are ready to move on to the next step. The ball toss is one of the most important parts of the serve, because it allows you to confidently control your serve. To have a consistent toss you need a consistent ritual. People like to bounce the ball three times before beginning to toss the ball up. Some people like to have it on the throat of the racket before letting go and then tossing. Some people like to combine these steps. When tossing the ball you should be tossing with only your fingers on the ball – not the palm. And also, your arm should be straight when tossing. And you do not want to throw the ball up. You want to let go of it with the release of your fingers! As you are bringing your arm up, when the ball is at eye level, that is when you release the ball up into the air. You want the ball tossed in front of you inside of the baseline. On flat serves, do not toss too far to the left or behind your head. Once you have the toss down and the use of the upper body down, try shadow swinging it a couple of time before moving on to the next step. Once you got the upper body and toss down, you are now ready to learn how to hit the ball. To hit a good flat serve you need to have good pronation. Pronation is basically the rotation of the hands and forearms so that the palms face downward. Pronation is generally described as ‘snapping the wrist’. I like to say “snap the forearm” because that’s the more accurate term. Don’t worry pronation isn’t all that hard. If you learned how to use your upper body in part II, then pronation will come naturally when you swing up to the ball. So all you have to do now, is turn your open up your body to the net just like you already learned (so your racket naturally leads on edge), and then immediately strike the ball with pronation. However, you may need to get the timing of your toss down first. People generally hit the ball at the maximum height the ball reaches (recommended) or as it is beginning its descent. And this is how it should look like if you pronated through the ball correctly – Palm facing to the side. Lastly, the follow-through should finish on the left side of your body. Practice this until it is second nature!! Part V – Incorporating the Legs and the Launch! Why did I put this as the last part? Because it’s easier to add the legs after you figured out the rest of the motion. You don’t want to learn too much at once. Learning how to use your legs and launch will give you more racket-head speed which will add more MPHs to your serves! So first off, before tossing the ball, you want to be leaning your weight on the left leg. Once you want to begin your toss, rock back your weight on to your right leg and then go on your tippy toes with both of your legs and with your legs bent enough that you mantain your balance. As you are going on your toes, both the tossing arm and racket arm should be going up at the same time! Once they are up and your legs bent and on your toes, you are officially in the trophy position! There are two stances you could use with your bent legs: the platform or the pinpoint. It is up for you to decide which stance you will use. Right now, you should be in the platform stance (See Federer). Some players like to bring their right foot in next to their left foot like Murray. This is known as the pinpoint stance. Now once you are in one of these positions you are ready to LAUNCH! The tip that works best for me when trying to launch into the ball is that *you want to try to jump up and over your left arm (right arm for lefties)! * Now, when launching yourself at the ball, your WHOLE BODY should be opening up to the net. Last time, we only opened up your upper body to the net because we didn’t learn the legs yet. Now that your hip is incorporated, you will be releasing some tremendous racket head speed. As soon as you open up your whole body to the net and have launched up and over your left arm, then immediately strike the ball with pronation. When you land, you land with your left leg (right leg for lefties). The great thing about the serve is if you play baseball and know how to throw properly, then you should be able to pick up the serve really quickly because the mechanics are practically the same.